Let’s say that you have a form with different fields and take into account just one of them, for example an text input field used to let a user enter his name. 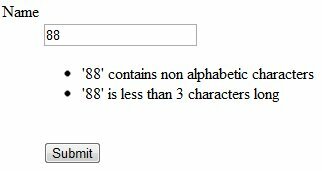 The validators that you can use are different, but for the sake of example we’ll limit the length of the name and it’ll only allow alphabetic characters and spaces. Speaking the Zend Framework language, we’ll use the Zend_Validate_StringLength and the Zend_Validate_Alpha classes respectively. As you may already know, Zend Framework is owned by the American company Zend and so all of the messages it shows are in English. The default behavior of the framework is to display one or more error messages for every validator broken by the user input. So, for those who are building a non-English website, there are two options to have messages readable by all users: translate every error message of the framework, or explain in one or more messages that the input is invalid and show suggestions to insert an accepted value. The first option is over-complicated, especially for small and medium-sized projects, so I’ll show how to use the second option. I’ll show the code that we’ll use during the article. First, this is the form that contains the input field for the name and the validators needed to check the data. In the controller we’ll check if the field is valid and act accordingly. Usually you won’t use the IndexController and probably you have this validation in a specific controller. Anyway, to simplify the example, I’ll use it. The view used is quite simple; it only shows the message and the form. This method, as well as displaying the given string(s), also marks the field as invalid. This line of code still doesn’t solve the problem beucase it will either show the same error message for every not-satisfied condition or it will have no effect. If the line shown is used in the init() method, in the same way shown for the setErrors(), in case of error, the custom message will be shown as many times as the number of conditions violated by the user input. If the line is inserted during the usual data validation within the controller, in the same way explained before, there will be no effect. This means that the custom message won’t be displayed and the framework will show only the default messages. Now the point is to understand when and how to insert the custom message so that the user can have a comparison and a suggestion about what values are accepted. Definitely, the when lies in the creation of the field inside the form (init() method) and the how is due to the union of the setErrorMessages() method and the use of a property of the validators of Zend Framework called breakChainOnFailure(). The latter allows us to stop the validation process at the first failed condition. If we set up five validators but the first of them fails, the other four won’t be used. A string (mandatory) to specify the validator to user. A boolean (optional, by default its value is false) to specify if the framework has to break the validation at the first failure or not. Thus, this parameter sets the value of the property breakChainOnFailure which is what will help us in achieve our goal. Using the second parameter passed as true for each of the validators that you want to use is essential. Using the code above, the form will show only the custom message when there’s invalid input… exactly what we wanted! In case you need to use more messages, for example suggestions in several stages, just add more strings to the array used for the setErrorMessages() method.